Every summer I make a different blueberry pie, always in search of the perfect recipe. I'm not sure this is it, but in my book it's very close. This recipe combines what I think are the essential components of blueberry pie: lemon (not cinnamon), more tang than sugar, and a flaky, buttery crust. The only caveat is that it's a bit soupy, but I prefer that to a gummy, over-thickened pie filling. 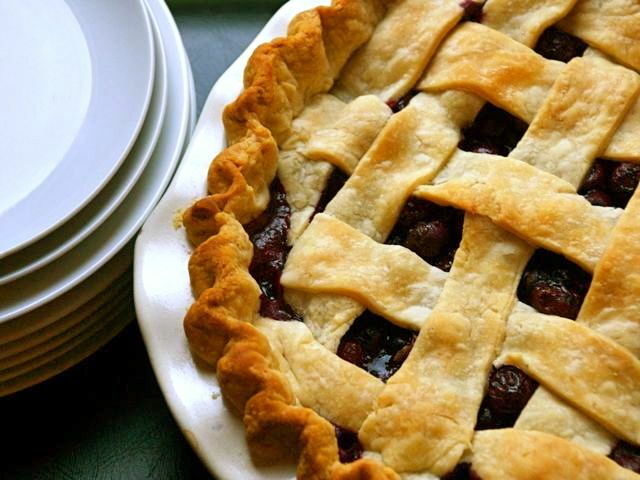 If you have a favorite recipe for blueberry pie, by all means share it! In the meantime, I'm going to keep tinkering with this one until I deem it perfect. Preheat the oven to 400 degrees. On a lightly floured surface, roll out half of the pie dough into a 13-inch circle. Drape the pie dough over a pie pan and chill. In a large bowl, mix together the blueberries, sugar, cornstarch, salt, lemon zest, and juice. Set the fruit aside while you roll out the remaining pie dough into a 13-inch circle. Cut the dough circle into ¾-inch strips. Pour the berry mixture into the chilled pie dough/pan. Brush the rim of the crust with water, then make a lattice top using the ¾-inch dough strips. Trim the pie dough to an overhang margin of ½ inch, then crimp the crust edges. Poke little bits of butter into the open spaces, where the berries are revealed through the lattice top. Set the pie on a baking sheet and bake for 50 to 60 minutes, rotating the pan halfway through baking. Bake until the crust is golden brown and the juices are bubbly. Remove the pie from the oven and let it cool on a rack. Serve warm or at room temperature, with vanilla ice cream if you wish.